When designing software, it is desirable to explore several different designs, i.e. consider several feasible solutions to implement a specific requirement or functionality and compare the advantages and disadvantages of each solution. Unfortunately, software modeling tools are often tedious to use when making significant changes within the design of a large software model. Aspect-oriented modeling (AOM) is a new modeling technique that allows developers to describe the design of their software using many aspect models. With AOM, each individual aspect model is small in size. To build larger systems, structure and behaviour defined in one aspect model can be (re)used within other aspect models. This reuse is achieved by establishing a mapping between the model elements in the two aspect models. This project focuses on implementing a touch-enabled aspect-oriented modeling tool for the Reusable Aspect Models (RAM) approach. The tool runs on the Eclipse platform, makes use of the Eclipse Modeling Framework for defining the meta-models of the supported modeling notations, and uses Kermeta to implement the model transformations of the weaver. The first version of the tool was based on our homegrown libjtouch toolkit. The video below shows a demonstration of our first prototype. It supported multi-touch enabled editing of structural views of RAM aspects (class diagrams), as well as touch-enabled specification of aspect bindings. Model weaving is not supported. 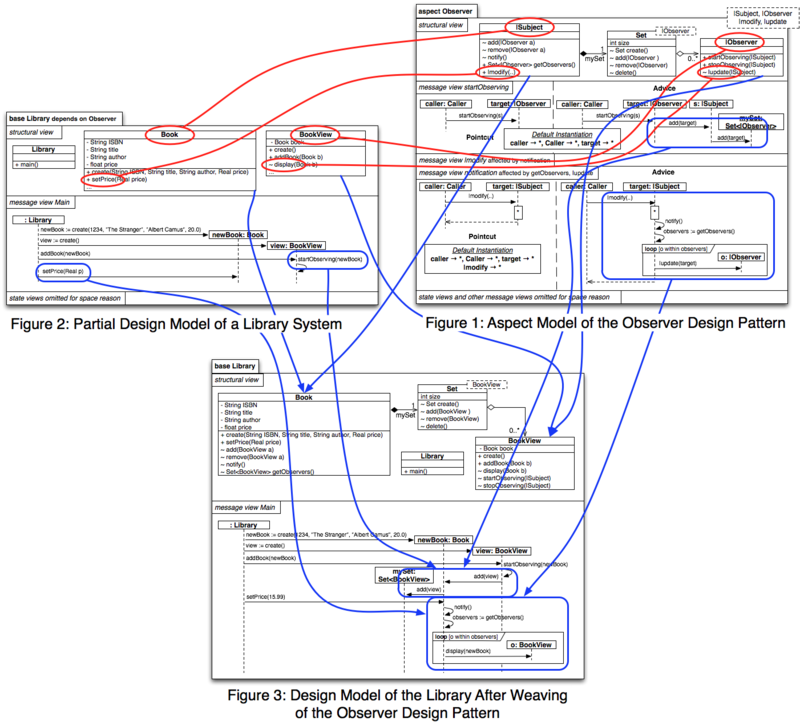 The picture below illustrates aspect weaving by reusing the “Observer” Aspect that represents the observer design pattern within the design of a simple library system. Jörg Kienzle, “Reusing software design models with TouchRAM,” in Companion Proceedings of the 12th International Conference on Aspect-oriented software development, AOSD ’13 Companion, (New York, NY, USA), pp. 23–26, ACM, 2013. Matthias Schöttle and Jörg Kienzle, “On the challenges of composing multi-view models,” in Proceedings of the First Workshop On the Globalization of Modeling Languages, GeMOC 2013, pp. 1 – 6, 2013. Omar Alam, Jörg Kienzle, and Gunter Mussbacher, “Concern-Oriented Software Design,” in Proceeding of the 16th Inter- national Conference on Model Driven Engineering Languages and Systems – MoDELS 2013, Lecture Notes in Computer Science, Springer, October 2013. Abir Ayed and Jörg Kienzle, “Integrating Protocol Modelling into Reusable Aspect Models,” in Proceeding of the 5th ACM SIGCHI Annual International Workshop on Behaviour Modelling – Foundations and Applications – BM-FA 2013, Montpellier, France, pp. 1–12, ACM, July 2013. Wisam Al Abed, Valentin Bonnet, Matthias Schöttle, Omar Alam, and Jörg Kienzle, “TouchRAM: A multitouch-enabled tool for aspect-oriented software design,” in 5th International Conference on Software Language Engineering – SLE 2012, no. 7745 in LNCS, pp. 275 – 285, Springer, October 2012.